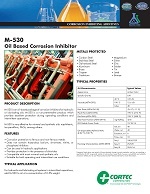 Description: M-530 is an oil-based package of corrosion inhibitors for hydraulic or lubricating oils. M-530 is a rust preventive, which provides excellent protection during operating conditions and intermittent operation. M-530 is very effective for mineral and synthetic oils: napthenic, iso-paraffinic, PAOs, etc.